Hovenweep National Monument - Super Inky! Hi everyone! I'm sorry I haven't posted in a long time. 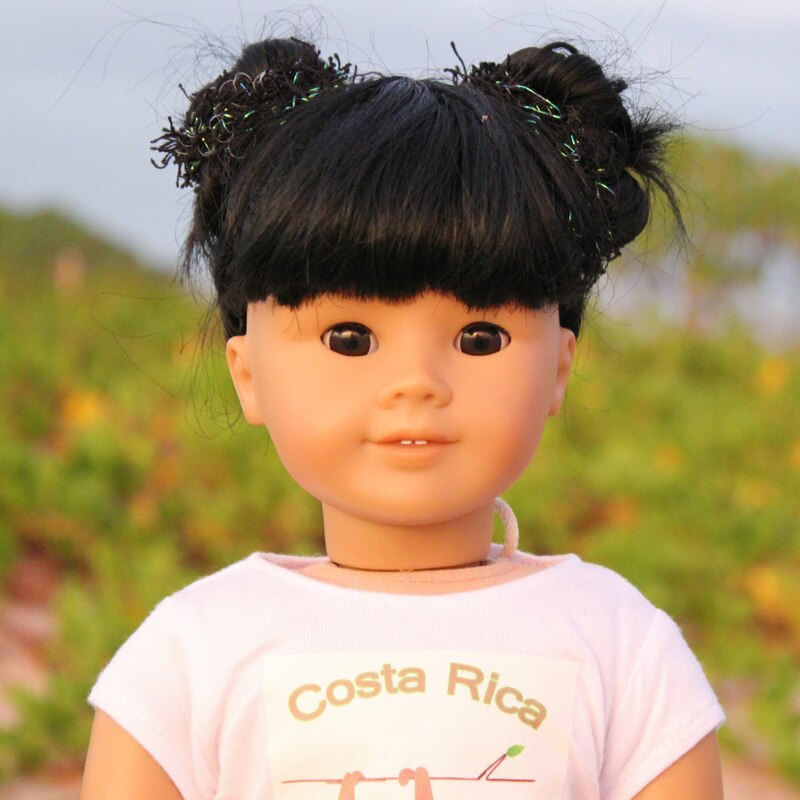 I've been traveling with my moms and grandma! I flew with my parents to New Mexico a few weeks ago. While that's pretty normal for my family- my Mama's family is from New Mexico- we had something special planned for this trip. 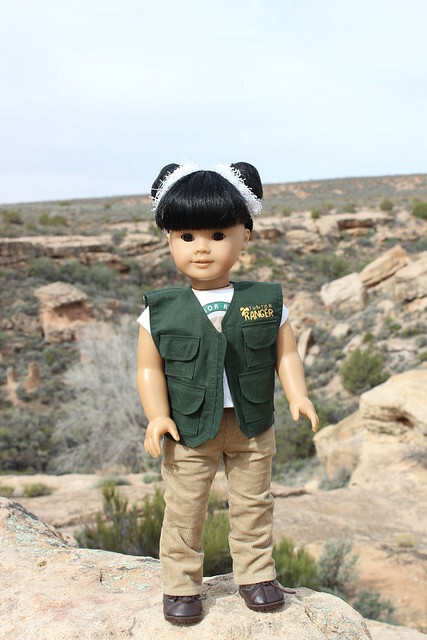 We were going to the Four Corners region to visit some National Park Service sites! The Four Corners area is where Utah, Arizona, Colorado, and New Mexico meet all together. The day after we flew into Albuquerque, we drove up to Durango, Colorado. We arrived after dark, but I made sure to get everyone up early the next day so we could start exploring the nearby parks! First on the list was a new park for my family- Hovenweep National Monument! 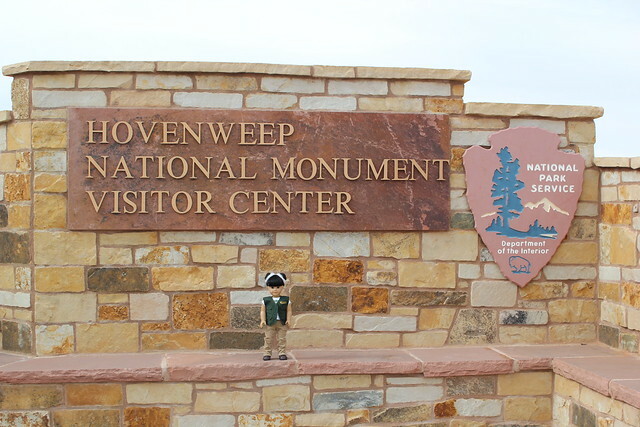 The Hovenweep visitor center is actually in Utah, so we had a bit of a drive to get there. I didn't mind, because the Four Corners area is gorgeous! 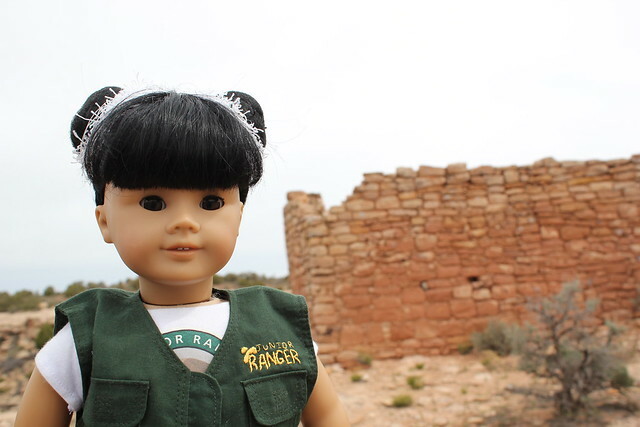 When we arrived at Hovenweep, I was super excited! I had done a lot of reading about the monument. It was declared by President Warren Harding in 1923. Hovenweep is made up of six different units; my family ended up hiking the Square Tower Group Trail because it is accessible by paved road. 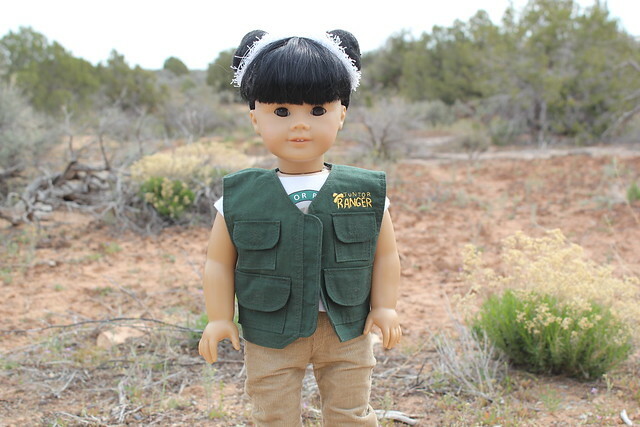 I was particularly excited to visit Hovenweep because a family friend had gotten me this wonderful new Junior Ranger vest! I felt very proud to be wearing it. Do you see the blue mountains in the background of this photo? That formation is called Sleeping Ute- you can see the Sleeping Ute's head and chest in this photo. The formation is visible from another park we visited too, so it was cool to keep track of the Sleeping Ute as we explored the region. 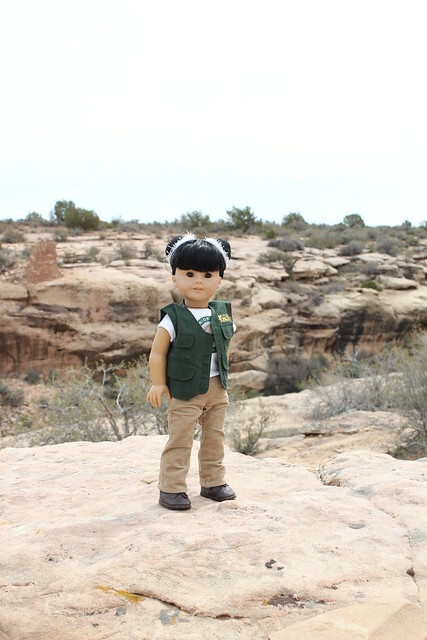 After we stopped by the Visitor Center to stamp my National Park Passport and pick up a Junior Ranger booklet, we set out on our hike. At Hovenweep, there is a special kind of dirt called biological soil crust! It's actually alive and made up of bacteria, lichens, and algae. To protect this special crust, it is especially important to stay on the trails. It looks really cool and I was happy to do my part in protecting it. The Square Tower Group trail loops around a canyon. You get to see many different structures built by Ancestral Puebloans- my Mama and Grandma's ancestors! We also saw a few different animals like lizards and birds. In this photo, I'm standing in front of Hovenweep Castle. It's a beautiful structure, isn't it? I love the masonry. The Ancestral Puebloans lived at Hovenweep between 500 and 1300 CE, but most of the structures were built between 1200 and 1300 CE. It was fun to imagine being an Ancestral Puebloan girl living at Hovenweep; it would be such a beautiful place to call home! I loved hiking around the canyon. There was one really loud bird- I don't know if it was a crow or a raven, but it kept squawking at me! After we circled the top of the canyon, it was time to descend down to the bottom of the canyon- and then back up! I was surprised at how tired I got. My grandma said it's because I'm not used to the high elevation. I live in New York City, which is basically at sea level- and Hovenweep is pretty high up compared to NYC! Once my family finished hiking the trail, we sat outside the visitor center so my parents could look over photos and I could finish my Junior Ranger booklet. 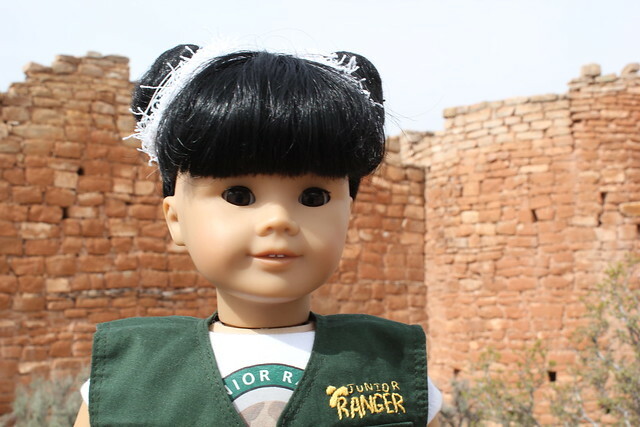 Hovenweep's Junior Ranger program is great- you really get to learn a lot about the Ancestral Puebloans and how they lived. 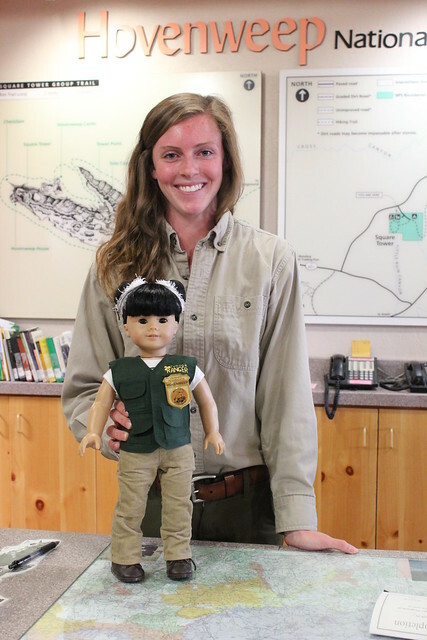 Once I had my booklet checked, I received my latest Junior Ranger badge! I really enjoyed Hovenweep. It's not as big as Chaco Culture, but I loved it just as much. If you are ever in the region, make sure to check out Hovenweep! 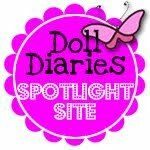 Have you ever visited somewhere "off the beaten path?" What did you see there? Wow, that looks incredible! Hope you had fun! Thanks Juliet! I did have fun! It's so good to hear from you. I miss you so much! "Off the beaten path?" Hmm . . . I'll have to think about that. My guardian, on the other hand, got to take a restricted trail (she had permission) in a state park last summer. She was going on a bear hunt! Unfortunately (or maybe fortunately), she didn't see any bears, but the experience was soo good, from what she told me. I wish I'd have been allowed to tag along. Lately it seems like she has much more fun without me, although I know that's not really true. 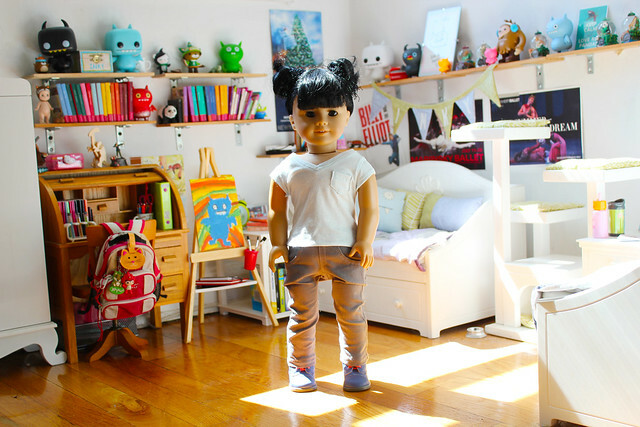 I need to convince my guardian to visit her cousins in NM . . . and take me, lol. I miss you a lot too! How cool that your guardian got to go on a restricted trail!!! I would love it if you visited New Mexico- especially at the same time as I visit! We could do some fun stuff together. Thank you for your confidence in me as a future ranger! 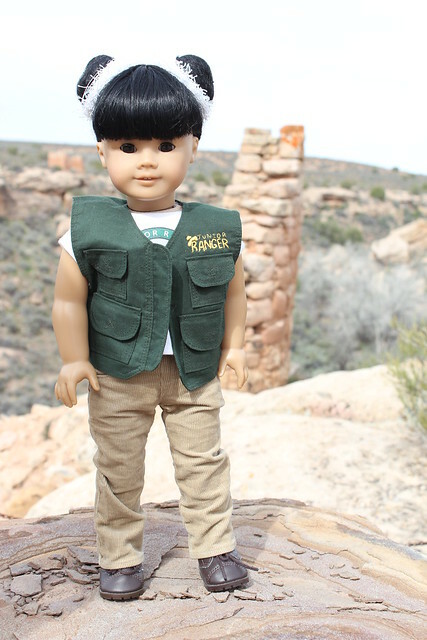 First I have to say - I love Inky's junior ranger vest, and her hiking boots. They're perfect for this adventure! That looked like such a cool trip. The scenery in the background of your photos is beautiful. I'm an unapologetic science and history nerd, so I found it really interesting to read about the biological soil crust (I never knew such a thing existed!) and the Ancestral Puebloans and the structures they built. There's something about ancient, crumbling buildings (and castles in particular) that draws the mind into pleasant daydreams about what it would have been like in times long ago. Thanks for the compliment on my vest and boots! 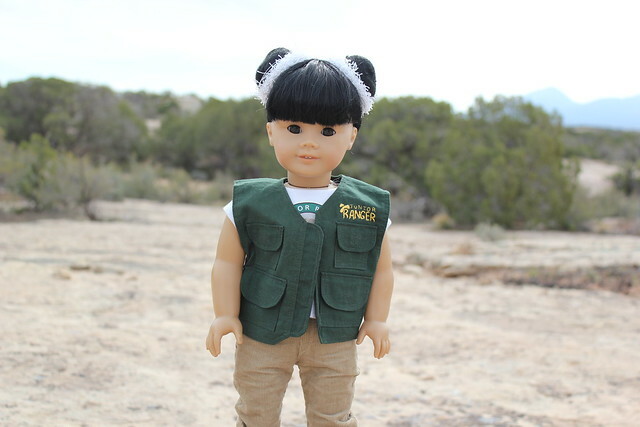 It's best to be prepared early to dress like a real ranger! The biological soil crust was really cool. And I am right with you on the daydreaming about living in a past time!